First, wash your wok with hot soapy water to remove the coating that is applied during manufacturing – hopefully this is the last time that soapy water will touch your soon-to-be burnished wok. Place the wok on high heat until all the water has evaporated. 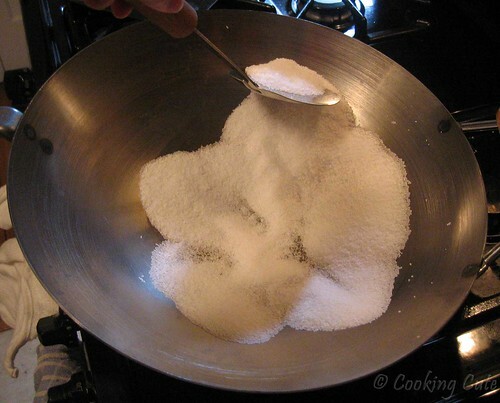 Pour in at least 1 cup of Kosher salt into the wok. 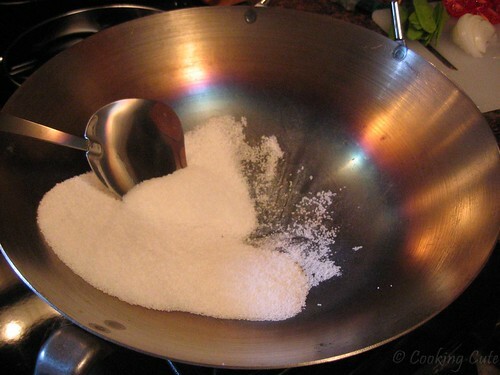 Stir the salt continuously for about 20 minutes, making sure to get the salt up close to the edge of the wok. Be careful not to spill the (very hot) salt. About 5 minutes in, you can see the patina beginning to form. The blackness starts at the bottom of the wok and gradually moves up the sides. 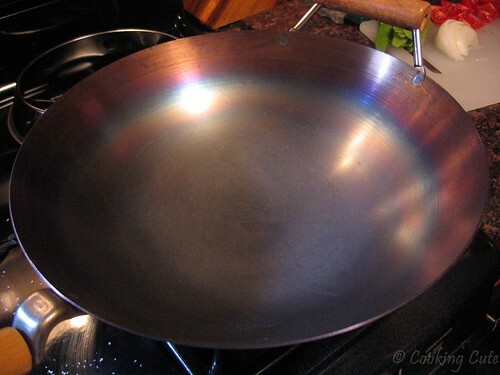 Here is what my wok looked like after about 18 minutes of hot salt tossing. Spread a thin film of oil on the wok. (I used a high-heat canola oil cooking spray, which I then rubbed in using a paper towel.) Voila! The wok is now black, seasoned, and ready to go. (The center of the wok is blacker than the picture shows. The ease of cleaning a properly seasoned wok is a thing of beauty. 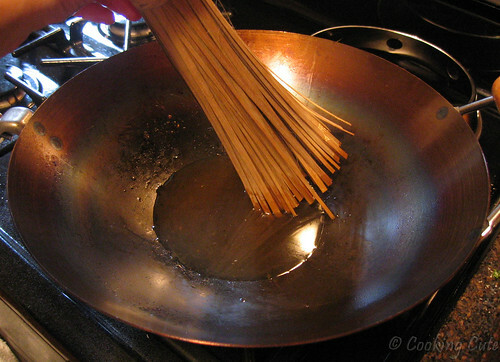 Wok cooking requires very little oil, and the food simply doesn't stick to it. I made fried rice without any problems (using only one teaspoon of oil) the day after I seasoned the wok here. Once you're done cooking, slide the food out of the wok. Then pour in some hot water (a huge billow of steam will escape) and swish it around with a non-abrasive brush. Here I am using a bamboo wok brush, but you can use whatever you like. Pour out the water and repeat if necessary. Then dry the wok on the stove over high heat until all the water has evaporated. 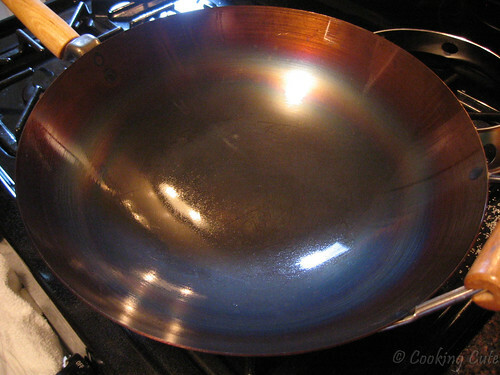 The wok may be coated with a thin film of oil to protect it from rusting (and keep it looking shiny and pretty). I store my wok with the cover on it to keep the oiled inside from getting dusty. Stovetop Method. Scrub the wok with hot soapy water. 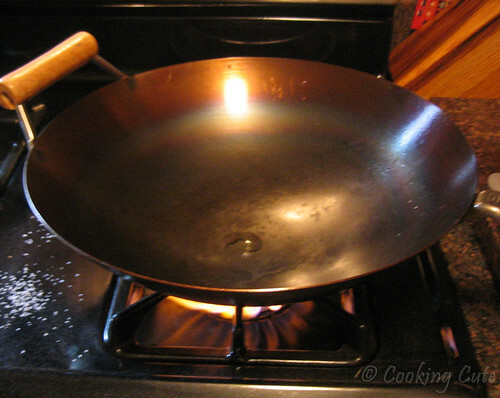 Place the wok on the stove over medium heat and let the water evaporate. Once the wok is nice and hot, pour in some cooking oil. 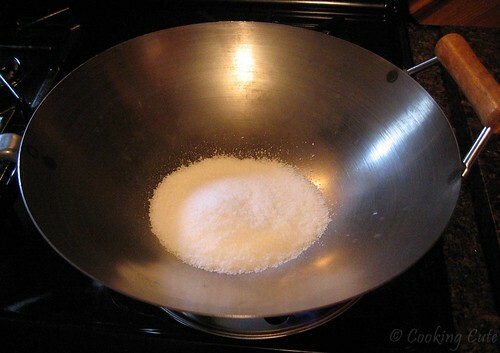 Use a paper towel to spread the oil over the inside surface of the wok. Use a clean wad of paper towels to soak up the excess oil so that only a thin film of oil remains. Turn the heat to low and let the wok heat for 15 minutes. Let the wok cool. The wok is then ready to use. Oven Method. Preheat the oven to 450°F. Scrub the wok with hot soapy water. 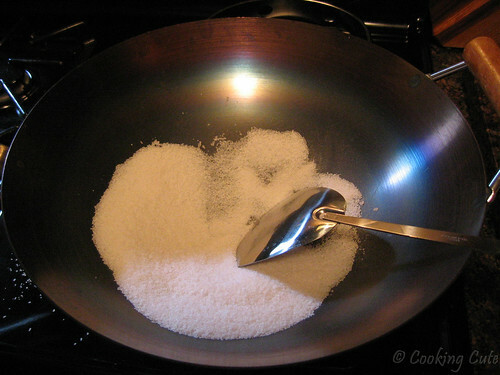 Place the wok on your stove over high heat and let the water evaporate. Then coat the inside of the wok with a thin film of oil. Bake in the oven for 20 minutes, then remove from the oven and let cool to room temperature. Wash and scour the wok and dry it on the stove again. Repeat the baking, cooling, and washing/drying process 3 to 4 times. When properly seasoned, your work will be bronze in color. Note: If your wok has wooden or plastic handles, remove them before baking. 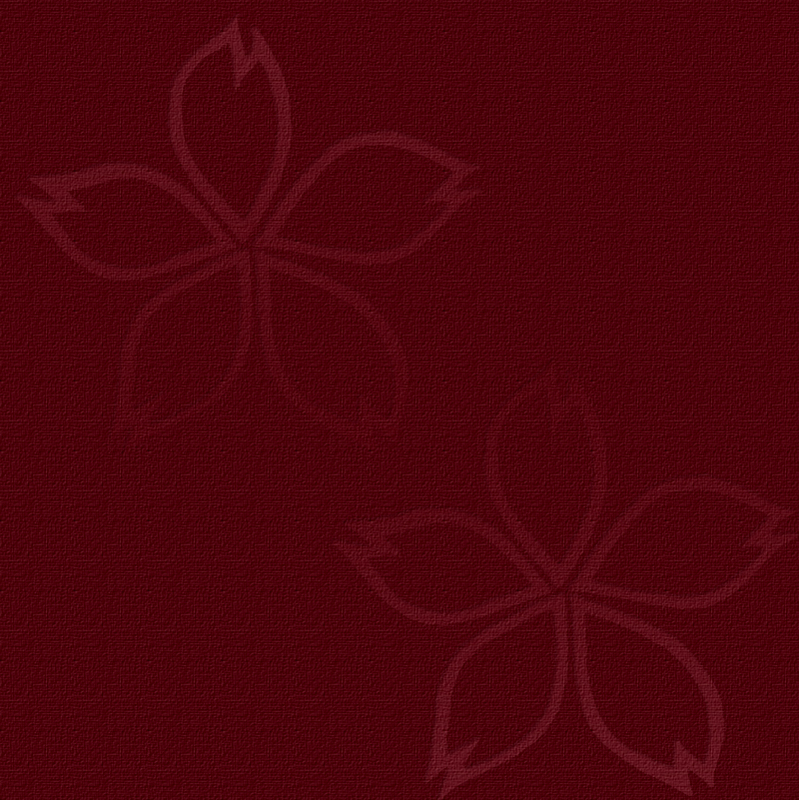 If you cannot remove the handles, cover them with a damp dishcloth, then cover the dishcloth with foil before baking. Watch to ensure that nothing catches fire.